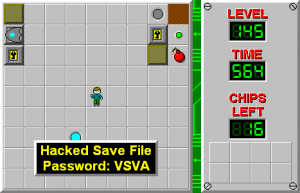 Hacked Save File - The Chip's Challenge Wiki - The Chip's Challenge Database that anyone can edit! ERROR_READ_FAULT 30 (0x1E) The system cannot read from the specified device. Hacked Save File is the 145th level in Chip's Challenge Level Pack 4. It was created by Josh Lee. It is the first of five secret levels of CCLP4 and is also where the fourth and final secret hint from Strandquist leads to. If playing in MSCC, the hint cannot be completely legible, as the text will cut off due to window space.